Another exciting milestone for food policy is upon on us. As many of you may already know, on July 8 at 7pm the Local Food Action Plan developed by the Local Food Assets Task Force will going to the Park Board for consideration. It would be great to have as many people out as possible, both speaking and simply in attendance, to show support. The report and draft plan will be available on the Park Board’s website by Tuesday, July 2 at noon. On this very proud day for our city when Mayor Gregor Robertson proclaimed June 21st, 2013 to June 20th, 2014 as the “Year of Reconciliation” we would like to invite you to a potluck dinner, presentation and discussion on Indigenous Food Sovereignty in Vancouver and the bioregion hosted by the Vancouver Food Policy Council and the Working Group on Indigenous Food Sovereignty (http://www.indigenousfoodsystems.org/about). Click here for a pdf of the poster and agenda with more details. 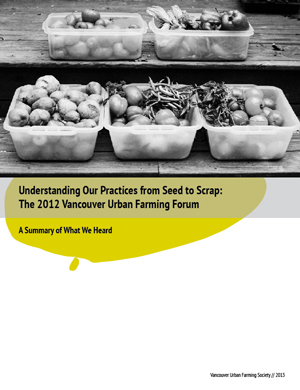 VFPC members Zsuzsi Fodor & Shelby Tay prepared a report recently for the Vancouver Urban Farming Society based on the Fall Urban Farming Forum. The report outlines information gathered from 18 urban farming organizations from across Metro Vancouver to create a baseline landscape of urban farming practices throughout the region. The Vancouver Food Policy Council is excited to let you know that the City of Vancouver has proclaimed Monday June 10th, 2013 as Meatless Monday. While livestock can be good for environments and meat can be good for health, she said, too much is bad for the planet and public health. Dinner ideas aplenty are coming in! The information collected through this research will be available on this webpage shortly. If we missed your Canadian municipal food policy initiative, please send it to us and we’ll include it as part of this resource.